It’s been a while since we’ve offered a deep discount on our famous monthly unlimited accounts, so that’s exactly what we’re going to do for the next week. We’re offering our unlimited usenet accounts for just $7 per month. It’s a lifetime rate and does not include Ghost Path VPN access. The regular price for this plan is $20/month, so it’s quite a steal. If you’re an existing block usenet customer and want to convert to the $7 unlimited special then you can email [email protected] and we’ll take care of it for you. What’s So Awesome About NewsgroupDirect Usenet Access? This promo is open to everyone except customers with a current monthly unlimited subscription. Expires September 15, 2015 at 11:59 PM EDT. PayPal payments are available immediately to new customers. Existing customers will be able to transition to PayPal payments over the next few months. As always, if you have any questions about our service or your usenet account then feel free to contact us at support at newsgroupdirect.com. The best deal in usenet is here! For 2 days we’re discounting our 1 TB blocks to just $40! Terabyte Tuesday will last for 2 days, from 12 AM EDT on August 25 until 11:59 PM EDT on August 26. Why Buy Your Usenet Blocks from NewsgroupDirect? The sale runs from 12 AM EDT on August 25 until 11:59 PM EST on August 26. No sale prices will be honored after the sale expires. The sale price is available to both new and existing customers. Sale only applies to 1 Terabyte accounts. You are free to purchase multiple 1 TB blocks if you choose. The best deal in usenet is live! For the next 2 days we’re selling our 1 TB blocks for just $40! Terabyte Tuesday will last for 2 days, from 12 AM EDT on July 21 until 11:59 PM EDT on July 22. Why Choose NewsgroupDirect For Usenet Blocks? The sale runs from 12 AM EDT on July 21 until 11:59 PM EST on July 22. No sale prices will be honored after the sale expires. The sale price is available to both new and existing customers. Sale only applies to 1 Terabyte accounts. You are free to purchase multiple 1 TB blocks if you choose. Our 4th Annual Summer Usenet Sale is live! We’ve previously called this sale our “Summer Blocktacular”, but we’ve added deals on monthly and yearly accounts this time so we decided to change the name. Our sale runs through July 16, and we have the following usenet packages on sale. 2 TB Usenet Blocks. Regularly $150 each, now just $70 each. Our famous unlimited usenet + VPN account. Regularly $24.95/month, now just $12/month or $111/year. Block usenet accounts get a discount on Ghost Path VPN access. Unlimited usenet accounts get Ghost Path access included, at no additional charge. The best customer service in the usenet industry. We have a couple of mailing lists, depending on your interests. We won’t spam you. The sale runs until 11:59 PM EDT on July 16. No sale prices will be honored after the sale expires. Current unlimited account subscribers aren’t eligible for the $12/month or $111/year packages. Block prices are available to both new and existing customers. It’s the best deal in usenet! For the next 2 days we’re selling our 1 TB blocks for just $40! Terabyte Tuesday will last for 2 days, from 12 AM EDT on June 23 until 11:59 PM EDT on June 24. The sale runs from 12 AM EDT on June 23 until 11:59 PM EST on June 24. No sale prices will be honored after the sale expires. The sale price is available to both new and existing customers. Sale only applies to 1 Terabyte accounts. You are free to purchase multiple 1 TB blocks if you choose. 2500 days of retention is a little hard to comprehend. That means that we haven’t deleted any articles because of storage space reasons in 6.85 years or 83 months. To celebrate the 2500 day milestone we’re having a weekend sale on unlimited usenet accounts. You can get unlimited usenet only for $75/year or unlimited usenet plus Ghost Path VPN access for $111/year. If you are a current block usenet customer and want to upgrade then please email [email protected] and let our support team set everything up for you. The sale runs until 11:59 PM EDT on June 21. No sale prices will be honored after the sale expires. Current unlimited account subscribers aren’t eligible. Here at NGD HQ we’re celebrating summer! 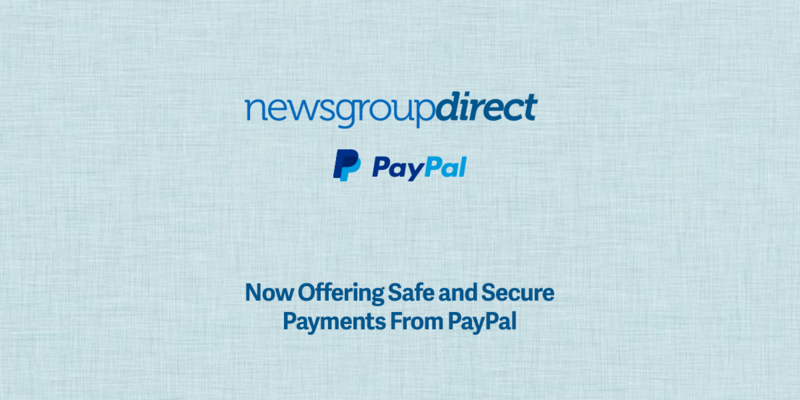 We don’t know any better way to celebrate with our amazing customers than to offer huge discounts on NewsgroupDirect usenet access. 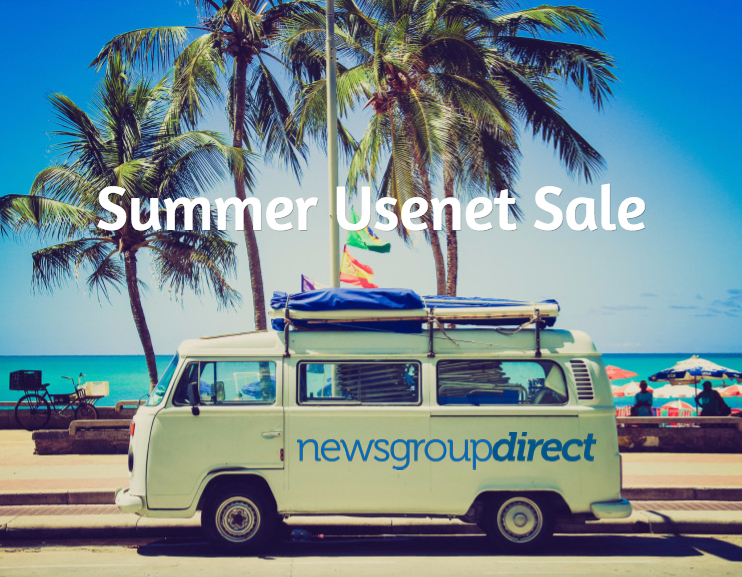 Our summer sale runs through June 15, and we have the following usenet packages on sale. 250 GB Blocks. Regularly $25 each, now just $15 each. 500 GB Blocks. Regularly $60 each, now just $25 each. Our famous unlimited usenet + VPN account. Regular $24.95/month, now just $12/month. Visit our usenet pricing page to purchase. What Makes NewsgroupDirect the “World’s Best Usenet Company”? The best customer service in all of usenet. The sale runs until 11:59 PM EDT on June 15. No sale prices will be honored after the sale expires. Current unlimited account subscribers aren’t eligible for the $12/month package. Block prices are available to both new and existing customers.